Today -- May 16, 2011 -- marked the final launch of the Space Shuttle Endeavour (watch the launch replay) after 25 missions and nearly 20 years of service. And to mark this occasion, our friends at Google are doing something REALLY COOL. 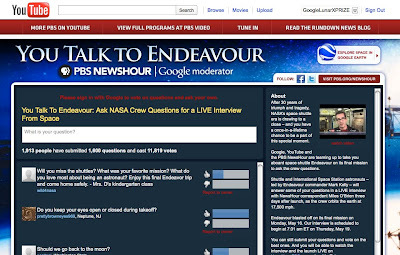 Secondly, Google has partnered with NASA and PBS to bring you a LIVE Q&A with the STS-134 crew, coming up in a just a couple of days. The great part about this is that Google is crowd sourcing the interview -- you can submit your own questions via Google Moderator and/or vote on the existing 1600 questions (give or take). The most popular questions will be asked by Miles O'Brien during an interview at 7:30am ET on Thursday May 19. Congratulations to NASA on a successful launch today, and to Google for helping to get the public involved in space exploration!